This is something different for Valentine's Day. Inspired by the today's launch of Cupcakes, Cookies, and Pies, Oh My, Liz of Hoosier Homemade made these for her weekly Cupcake Tuesday. 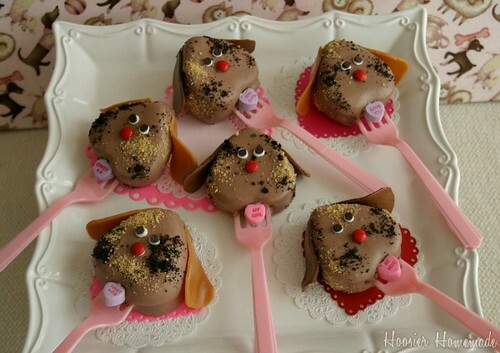 These puppy love cake pops are adorable and with the upcoming Westminster Dog Show and Puppy Bowl, these are very topical. Learn how to make these puppies! Thanks so much for sharing my Puppy Love Pops! They are such fun! And I LOVE Karen & Alan's new book!